The best way to file taxes for teenagers... is to make them do it themselves. We have a 15 year old and a 19 year old and we are helping a 21 year old. This is how each teen filed their taxes. I don't know about yall, but I didn't file my own taxes until I was married and we were on our own. We had a MILLION W-2's and mileage deduction and car depreciation. It's amazing how we really did live on both of us working $8 an hour almost full-time jobs, but we definitely couldn't afford the luxuries, like Wal-Mart tax professionals. So that became my part time job at home - as it took WEEKS to get our taxes filed the first time. Thankfully, years of practice has made this much easier to handle. We want that same confidence for our teens, so as soon as they start getting a W-2 we have them start filing their taxes. We knew Mateo, our almost 16 year old (*gulp*) didn't need to file his taxes, as he only made a little under $2000 last year, but we want him to get in the practice of using this muscle now. Also, he is our investor kid and LOVES the fact that he can contribute up to the amount he made last year in an IRA Roth to start setting himself up for retirement. So, that's his financial goal this year. With this being is first year, I had him sit with me and tell me the information on the form and I typed it in. We file online most years and was the case for him this year. Next was our Hannahbear. (Yes she is 19 and I still call her such things.) Since she was 16 she has sat next to me as I typed in what she told me. This year, at her own computer, she filed her own taxes. You guys, I am so, so happy for her. This is FREEDOM for her and I hope it's also putting coins in her jar of confidence that she totally can handle this adulting thing. Lastly, came the precious 21 year old that is learning all kinds of skills for independent living. She had some W-2's, Student loan forms and a few other variables to work through. So, we had her head up to her local H&R Block office and have them sort through the docs. She was in and out in 30 minutes and we all had peace of mind that all the details were taken care of. All this is our way of helping our teens continue to be more prepared than we were for adulting. Filing taxes is just one more way they can know that they've got this. 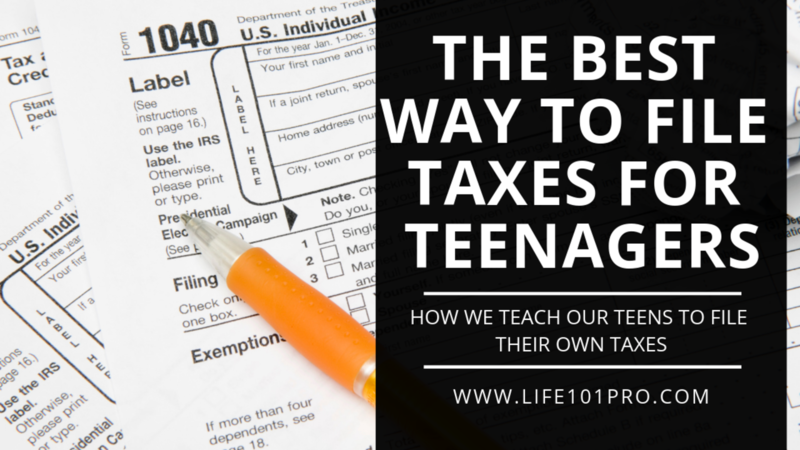 When do you have your teen learn how to do their taxes? Hop on to the FACEBOOK PAGE and let us know.